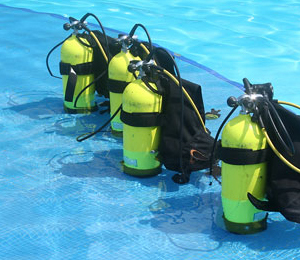 An excursion scuba diving Key West territory is often a great opportunity to have upfront encounters with the wonders of underwater life. 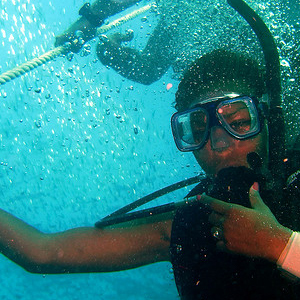 One fish, made popular by the classic Pixar film "Finding Nemo", may catch your eye will scuba diving. Most of us know this fish as "Doire", but it is most commonly known as the "Blue Tang". There are many names for this specimen, but all its aliases are derived from two key characteristics: its color and the "thorny" points that are stowed in its tail. "Tang" is actually a term coined by explorers who discovered the sharp spines pointing out from either side of the fish's tail when threatened. 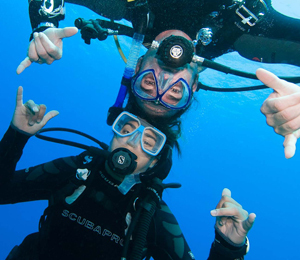 Some divers who call it by its alias of "Blue Doctor" actually do so because these spines resemble the scalpels used by surgeons. These sharp extensions lay flat against the tail of the fish only until the fish is threatened. Like claws of a cat, the Blue Tang can extend and retract these pointy defense mechanisms in accordance to the threat level it is sensing. This fish can actually inflict quite a considerable amount of damage on its enemies when its in full attack mode, thrashing its spiked tail from side to side. Considering its common name, one would expect the Blue Tang to be dominantly blue. This is true only after the fish is matured, as yellow is actually its primary color in youth. Blue spots can still be seen in this younger stage, but only near the eyes. The average length of an adult Blue Tang is about 12 inches, and it can be found living on its own, in a pair, or in a large group most commonly seen in reef environments. Blue Tangs work in a symbiotic relationship with aquatic plants, eating dead algae for nourishment and thus removing the substance notorious for suffocating coral. 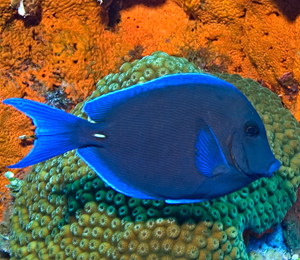 In reef environments, blue Tang can often be found in narrow crevices to evade potential predators such as tiger groupers, tuna, and bar jacks.